Artificial Intelligence (AI) is unquestionably set to revolutionize business as we know it. There are seemingly countless ways that AI can support companies and help them become smarter, more profitable, and more prepared for the future. AI is becoming far more mainstream, especially as people are starting to understand that Big Data and AI are not as scary as the sci-fi movies make it seem (or at least not yet). In fact, AI adoption in businesses is expected to reach 75% this year, as demand for this technology is growing across the board. Customers are beginning to expect more from brands in terms of optimized and personalized brand experiences. Since customers now use an average of four to five devices to interact with brands online, e-commerce sites must offer a truly continuous experience that picks up right where they left off. To do this, AI must be a part of each step during the buyer’s journey from start to finish. Here’s how you can make this happen. During the initial phase of the buyer’s journey, brands must find ways to captivate potential customers, make them aware of their need, and provide the information they are looking for to push them towards a purchase. To grab their attention, most online companies focus on keyword optimization and SEO strategies to boost their website’s ranking for initial searches. There are two smart approaches for e-commerce businesses to take so AI can make the most of their SEO strategies. AI can analyze keyword data extremely fast and even make conclusions – thanks to deep learning methods that would never be possible with manual research. 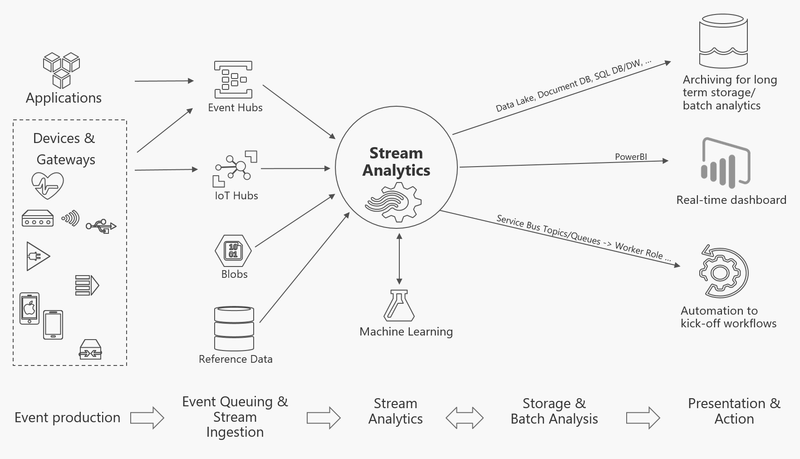 Furthermore, AI can even use predictive analysis to figure out what your customers’ next move may be (such as their next search question) and map intent with real-time stream processing for more relevant results. The second approach online brands should take is to invest in an SEO-friendly e-commerce website. This means that their hosting service should be structured in such a way to fully optimize all those AI-researched keywords by connecting various navigational links for more relevant results. Image optimization is also a key factor here, as a Rivet Works study found that e-commerce customers focus heavily on visual content during their initial research. If your website images are tagged properly with the correct keywords, and your site is optimized to do so, then potential customers will be able to find the content they are looking for far more easily. SEO is an important part of every step of the buyer’s journey, but it plays an especially significant role during the initial awareness phase. Online brands must be sure that their strategy is strong and thorough, so using AI analysis for identification and evaluation is the best approach to take. Once customers have become aware of an e-commerce brand or product, the next step is to take it into consideration, especially in comparison to its competitors. According to Pew Internet’s research, 86% of online shoppers report that they compare purchases with other sellers for price differences and 84% look for a seller that they are more familiar with first. In order to win out against comparison shoppers (especially if your brand is not able to offer lower prices), e-commerce brands must find a way to establish their competitive advantage. One of the best ways to do this is through superior service and support. AI can help provide this by fulfilling two of the key customer service needs: self-service and immediate assistance. Should a consumer come across any issues or obstacles during this consideration stage, any misstep in how it is handled could be enough for them to look elsewhere. After all, the customer experience is incredibly influential in the decision to make a purchase, and as many as 74% of your customers will leave for another business if they find the process to be too difficult. This is why integrating a conversational chatbot with AI support can provide a better experience. Rather than having to call into the help line when a customer needs to ask questions or learn more about your product or service, they can receive immediate help on their own by typing out their query or selecting from an FAQ list with a chatbot. Brands that have integrated AI chatbots into their sales strategy have reported excellent results. A case study on Anymail, a SaaS provider, found that a third of their customers used this chat option before making a purchase, and this channel alone drives in 60% of their revenue. Online retailers have been able to benefit greatly from AI chatbots to help answer common queries, proving that it is certainly not limited to any industry. According to a report from Salesforce, customers are more likely to shop elsewhere if a brand does not offer personalization or anticipate their needs. The best way for brands to be able to truly provide these services is with AI assistance. Again, thanks to the power of AI and Big Data processing, e-commerce sites can virtually predict a customer’s needs or potential desires during the shopping process, and fulfill them before the consumer even realizes it. Amazon famously does a fantastic job at this – thanks to their incredibly data-rich resources and AI capabilities. Their product recommendations are highly personalized based on a customer’s unique searches and browsing history. This allows Amazon to offer highly relevant upsell and cross-sell product recommendations, based on what other customers have purchased in the past or what that individual may like based on their previous purchases. Although e-commerce brands may not have the budget for such an intelligent recommendation service, they can use their own database of customer information to provide personalized recommendations, offers, and incentives. According to Brilliance’s report, 31% of revenue for e-commerce sites was generated through AI-supported personalized recommendations with over five times higher conversion rates from these cross-sells. Online brands face fierce competition since consumers have lots of options when it comes to purchasing nearly anything online. Therefore, e-commerce companies must do all that they can to move their customers along the buyer’s journey as quickly and effectively as possible. By offering relevant content and easier search processes, customers will find it easier to become aware of and familiar with your brand. Once they move to the consideration stage, AI can make sure that nothing stands in their way of progression by offering instant support to answer their questions. And finally, customers can get exactly what they want and deserve from an online retailer with AI-enabled personalization for better shopping experiences. The best way to increase conversions as an online business is to provide an exceptional experience during each step of the buyer’s journey. While many factors play into the entire CX, AI tools can help ensure that customers are thoroughly supported and delighted as they move through each stage.